Summary: For this project, we will perform an intravenous pharmacokinetic analysis of meloxicam in loggerhead sea turtles (Caretta caretta) to establish an appropriate dosing regime and to help define the disposition of the this nonsteroidal anti-inflammatory drug (NSAID), allowing for accurate and dependable IM and PO pharmacokinetic studies in the future. Sea turtles, all species of which are threatened or endangered, often present to rehabilitation facilities suffering from wounds, entanglements, fractures or other presumed painful or inflammatory conditions. Extensive literature review and investigation reveal no pharmacokinetic studies on any class of analgesic or anti-inflammatory in sea turtles. 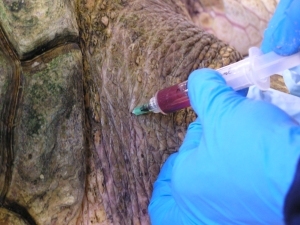 Veterinarians may administer corticosteroids, opioids or nonsteroidal anti-inflammatory drugs to try to alleviate the pain and inflammation associated with a turtles injury or illness. These animals are frequently immunosuppressed, contraindicating the use of steroids, and a recent study cast doubt on the efficacy of opioids in reptiles. While NSAIDs have been used and studied extensively in mammalian species and to a lesser extent in avian species, only one study on the pharmacokinetics of an NSAID, meloxicam, has been carried out in a reptile species, that being the iguana. Meloxicam is a COX-2 preferential NSAID. Research indicates that COX-2 inhibitors serve as a promising therapeutic option not only for the treatment of inflammatory states but also for cancer, which could potentially benefit sea turtles suffering from fibropapillomatosis. Meloxicam has been used in Canada and Europe since 1994 and in the United States since 2003 in various domestic and exotic species, including reptiles. Currently, dosing regimes must be extrapolated from mammalian species, thus why a pharmacokinetic analysis is warranted.